This crunchy seeded granola is delicious served on top of yogurt. Gluten free and vegan. Preheat the oven to 300°F / 150°C. Add the sugar, honey, and oil in a small saucepan, and place over low heat until the sugar is completely dissolved. Stir occasionally. While the sugar is dissolving, in a large bowl, mix together everything else. Once the sugar mixture is completely dissolved, slowly pour it over the oat mixture, stirring until the oat mixture is completely and evenly covered. Pour the granola onto 1 large roasting tray, and distribute it evenly. Bake for 25-30 minutes, then stir the granola. Bake for an additional 20-25 minutes, until the granola is a pale golden brown. The granola will harden completely once it is cool. Set granola aside to cool completely on the pan before storing in airtight containers. 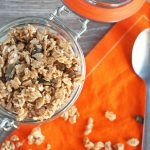 Get this recipe for Healthy Seed Granola Healthy Seed Granola (Vegan, GF) at https://www.theworktop.com/breakfast-brunch-recipes/seeded-granola/.